Rumors circulated yesterday that a cheaper Nook Tablet was on its way, and now it's official. Barnes & Noble is launching an 8GB version of its tablet, to go on sale for $199. Yes, that does make it a direct Kindle Fire competitor. 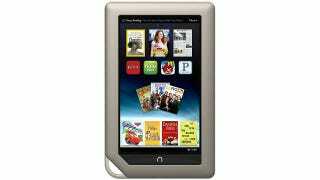 New 8GB Nook Tablet Launching February 22nd? It really is identical to the existing Nook Tablet, expect for the fact that it has half the storage—making it the same capacity as the Kindle Fire, too—and is $50 cheaper. The storage is split on the Nook, with 1.5GB being dedicated to B&N content and only 4GB being available for user files.